Is it my string stop? Okay, now that's outta the way, this Icon won't tune. I had new strings installed and even the tech said he struggled to get it paper tuned. So, after fussing with it, ther only thing I can conver up with is the string stop, here's why I'm doubting it. The string doesn't line up on it centered, it's close, but there's a groove, and it clearly isn't in that groove. So I'm wondering it if is causing inconsistent string travel. Also, on my Black Ice (God I wish I'd never sold that bow), I added an aftermarket stop and set it up with the string actually touching the stop at rest, this one has a small gap. Do you think adjusting my stop might help me get this rig shooting consistently? Thanks in advance. oriented correctly and retighten the side set screw. Have you checked cam timing, and cam lean ? Your arrows the correct spine ? Have you checked cam timing, and cam lean ? This is what I suspect. 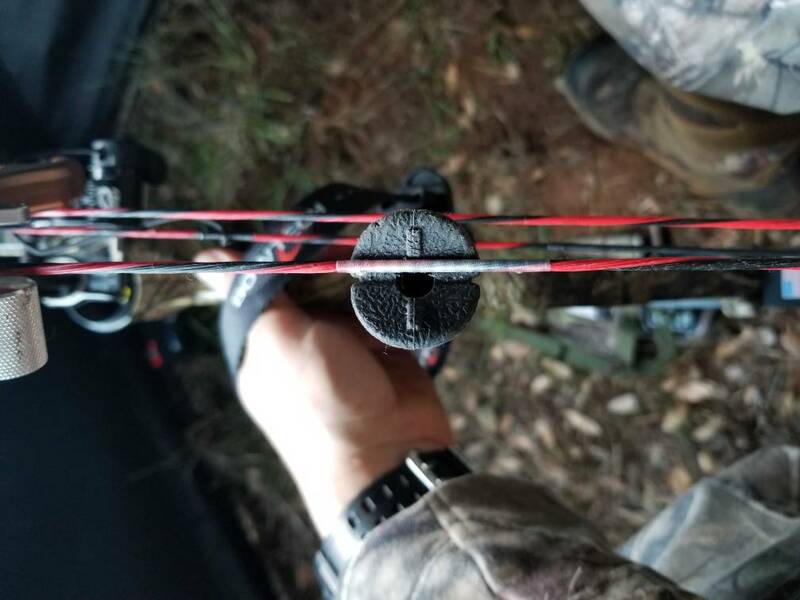 If the string isn't tracking straight it means the cams are off. And if they are off at rest, the lean is often exacerbated at full draw. Yes, cams are in time and do not appear to show any lean. Are both the cables inside the marks and both stops hitting at the same time? With new strings recently I still suspect one cable is twisted too much pulling the cam and string over. Without yokes to tune with on binary cams we are a little more limited but can still tune with the cables and/or shims. Yeah, both cables inside the marks, even with same alignment, not one closer to ome end of the range and the other centered or closer to the other end. That was the first thing I checked. So I adjusted it until it lines up centered and just touches the string. Not sure if it really helped tuning because it's so windy, but it sure made the bow quieter by a long shot! The only other thing i can think of is string stretch, my peep is still rotating ever so slightly about every 10-15 shots. Ok. Your not saying what’s going on. Take a bare shaft. Stand 5 to 8 ft from it. Shoot the shaft through paper. What does the tear look like. This will get you started. Well that's not possible, I'm at the deer lease this weekend and it's 20mph winds. Essentially, my broadheads refuse to hit with my field points. They'll be an inch low and 3 inches left. Make an adjustment and get them hitting closer and 5 shots later broadheads will be high and right without making another change. If Hoffy's wad open tomorrow I'd drop it off with Aaron but I don't think they are. It's been a while and i've slept, but i want to say it was Winners Choice. How about the stops at full draw? Are they hitting at the same time? In time and in synch are not the same thing. It could also just be a spine or rest tuning issue. I just know from tuning some Bowtechs these are things I had to get right before I could bareshaft tune properly. The Icon has only one stop, but if it helps, the other cam stops turning when the one stop hits the limb. Yeah, that's the plan i guess, just though to find the time.